So, we guess by being here you want to know if the Lemon Shark All Round Cross SUP is for you? 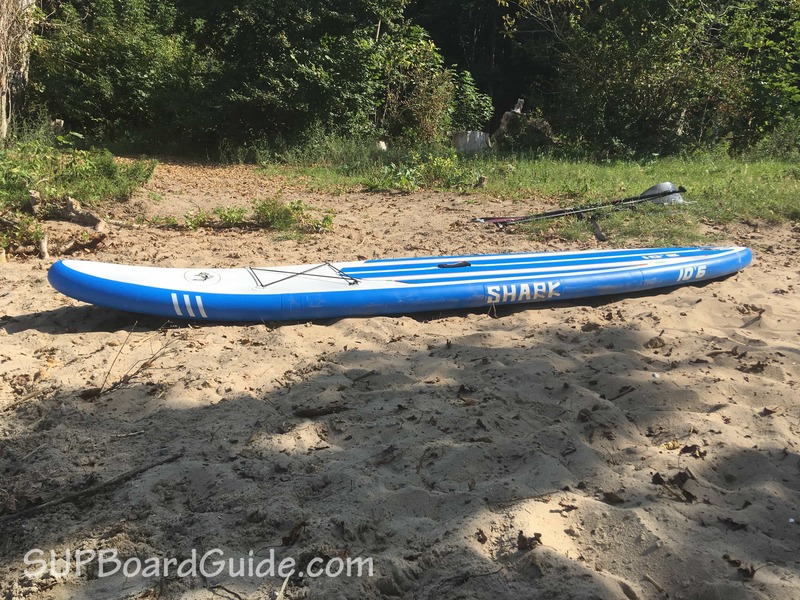 We’ve tested the Shark, looked at other reviews, talked with manufacturers and the result is hopefully the most informative Shark All-Round Cross review on the internet. Want real unbiased information? …read below! Don’t waste any more time scanning sites only to find the “info” is copy-pasted from the manufacturer sales pitch. The first thing you’ll notice is the pulled in, pintail. It makes the Lemon Shark extraordinarily responsive in turning. The downside is of course that the board is slightly less stable than other boards with a more rounded tail. However, that is to be expected and the general trade-off you face. Even though we didn’t get a chance to take it out in the surf, it definitely would handle waves up to a couple of feet well, which really punches that All-rounder title into place. Next thing to be noticed is that you’ll be gracefully gliding and with some substantial speed thanks to the combination of the large center fin for excellent tracking and the narrow body. Now the downside of the performance is in the specs of the SUP itself. The advertised max capacity (95kgs/209lbs) of this board doesn’t live up to its claims. The board’s max capacity is fairly low and will not be enough for most men. I myself at 85kgs/187lbs found the water lapping over my toes. Not only is slightly sinking uncomfortable, it also takes away from the stability and speed, however, the biggest issue is the flex. It’s due to the thickness of the board, at 4”, it’s prone to a little flex in the middle with anyone my build or heavier. Given the performance outside of this issue, if you are a lighter rider or want a present for your kids or wive, the Lemon Shark is an absolute dream. However, the board is far off from the advertised weight capacity which I did have to deduct points for. 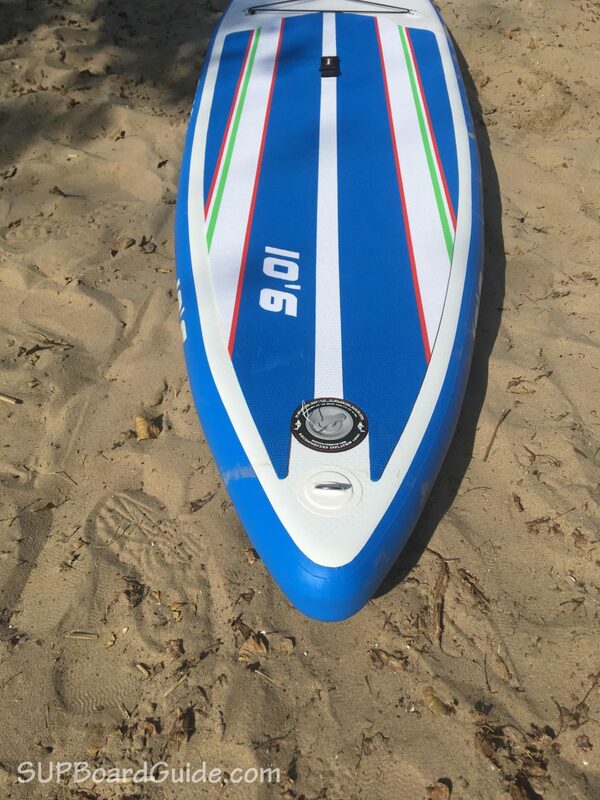 It’s a great board for lighter riders, especially if you want to get out in the waves. Instead of the 75-95kgs / 165-209lbs weight capacity, it would be ideal if you weighed no more than 75kgs. That’s also the reason we deducted a significant amount of points from the performance rating above. While it’s a great board for light riders, it is advertised as a board suitable for heavier riders as well. Since that’s not the case and we have an overall rating the board’s overall star rating is fairly low. Update: SharkSUPs has informed me that the previous figures on their website were a mixup and they’ve corrected any wrong claims. The board capacity is now fully within the claimed limit. Note: I asked a friend that weighs 98kg/216lbs to step on the board. If you like the Cross but weigh more than 75kgs the 11′ version is a great option. It’s the same shape but slightly longer. Most importantly, it is 6″ thick meaning you won’t have any of the issues above. You can find it here. Super tough, military-grade drop stitch PVC layers ensure the Shark SUP’s Lemon Shark durability and resilience to damage. You see the same materials used for things like life-saving boats, floating docks, and even some aircrafts. The board, when inflated, has thousands of threads that stretch out top to bottom resulting in a stiff frame from toe to tail. Now if you combine an inflatable with the optimum thickness (6”) and these materials you have an inflatable that’s distinctively comparable to a hardboard. Where the Lemon Shark tries to make up for being 4” thick instead of 6”, is that it can be safely inflated to exceedingly higher pressure than other inflatables. For lighter riders that means a very stiff board that you can take in the surf. The overall materials used and the quality of the board is very high. However, the construction rating is low for the same reason the performance rating is low. Overall a 4″ thick SUP won’t be able to compete with a 6″. 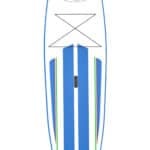 If this SUP was 6″ thick 90% of the problems it has today would be solved, and it would be fantastic for anyone heavy or light. You’ll find three fins with a removable 9” inches of stability/tracking delight for the center fin. 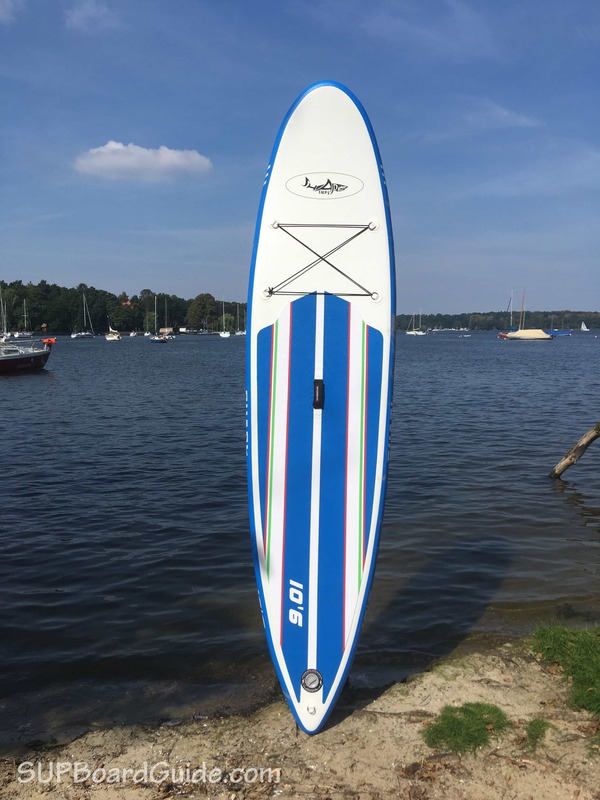 The setup of the fins provides stability, and the large center fin doesn’t hold you back on maneuverability, more so thanks to the shape of the tail. Pumping is much the same as any SUP. As is the recommended PSI of 15. However, as a bit of promise for safety, Shark company insists you can safely pump this board to 25 PSI. However, 15-18PSI is more than enough for anyone. 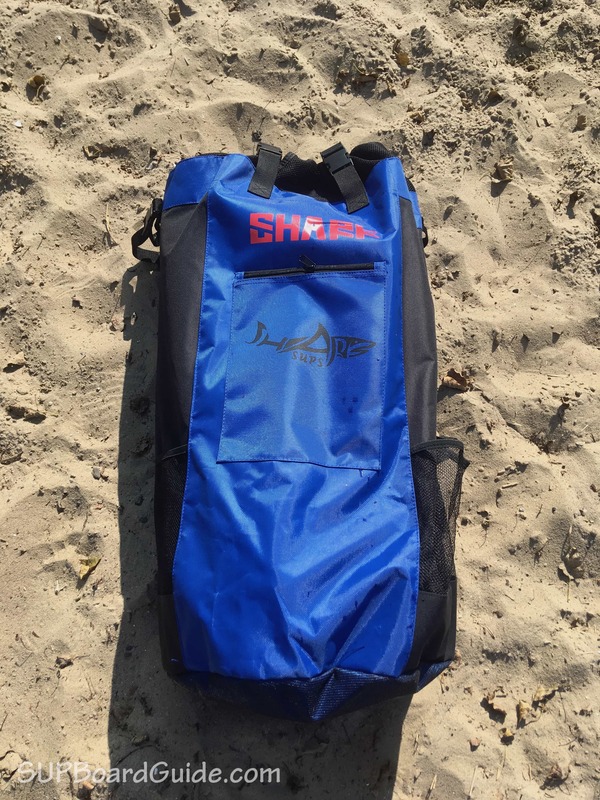 When you unpack your Lemon Shark, you’ll also be unpacking your Bravo SUP4 Easy pump. The only difference you may find with your inflate using the pump is if you haven’t used a dual action before. Dual action pumps are incredibly resourceful, and as a tip, switch back to single action pumping for the last few pumps, it’ll make your life easier I promise. It’s a simple design on the deck, but I think it looks stylish. The colored stripes are printed onto a diamond groove EVA deck pad, and it is more appealing than the standard duo color schemes. 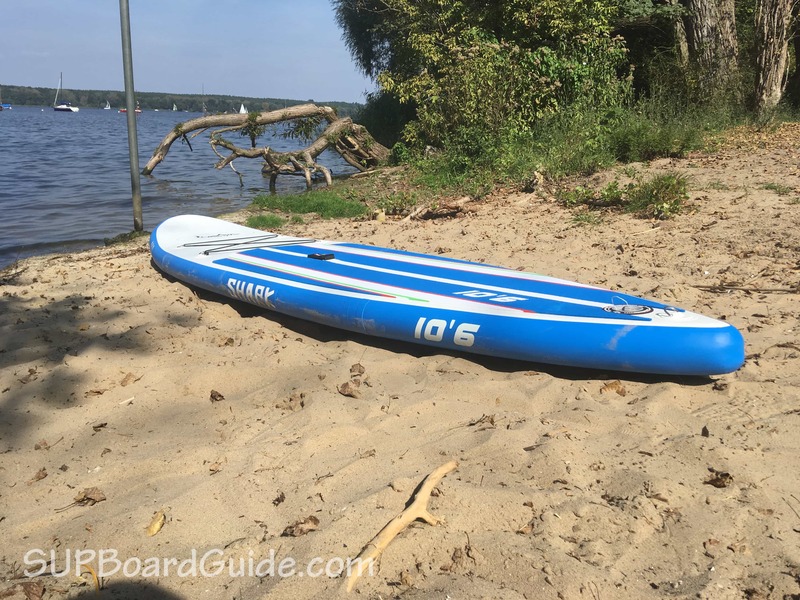 While you can find other SUP packages that have better carry bags and more handles on the board itself, you’ll also find them substantially more expensive like the Red Paddle Co 10’6. As far as weight goes, the Lemon Shark sit on the lighter side of the scale at 22lbs / 9.9 kgs. Having a lightweight SUP is great for nimbleness on the water but even better for portability. We weigh all the SUPs we test, and most boards are slightly heavier than advertised. The All Round Cross came out at 9940g, so slightly less than advertised making it one of the lightest SUPs on the market. Depending on what level of paddler you are, you can choose between the standard or upgraded paddle. The standard paddle is cheap and is just what you expect from an entry level paddle. It’s made from aluminum, floats, breaks down into three pieces, is adjustable and weighs in at 1120g. If you are starting out or don’t have another paddle at home, it’s acceptable. The upgrade is a bit more expensive and definitely worth the extra pennies. The blade shape, material, and weight are all different. Made from carbon fiber, not only is it more durable, but it’s also significantly lighter at 770g. 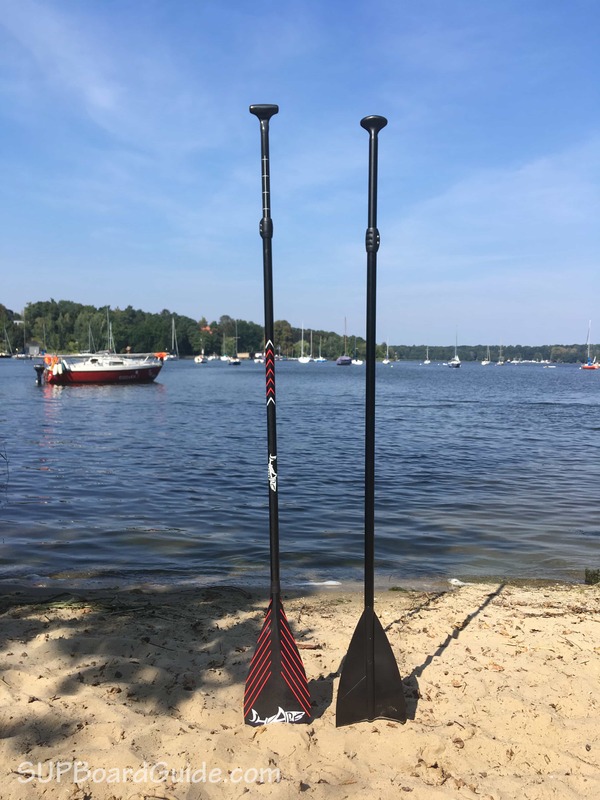 Lighter means longer lasting paddle strength, additionally, on the point of longer paddling, the upgraded blade shape gives more propulsion from your strokes and requires less effort. I will write a full review of the Shark carbon paddle later on and can tell you already that you’re getting very good value for money when you decide to upgrade. Shark also offers a coiled leash. The leash is well padded and high-quality. If you’ve been following SUPBoardGuide for a while, you know how often I stress the importance of wearing a leash. I personally prefer a coiled leash and if you intend to paddle in open water it’s an absolute must-have. The solid manual Bravo SUP4 hand pump is included. We already know the pump from other boards since it’s the standard option. Standard, in this case, doesn’t mean bad. It does a good job at inflating boards, has a strong handle and feet and it’s dual action and high pressure. Given that the board is 4″ thick you can expect to inflate it in just 5 minutes. 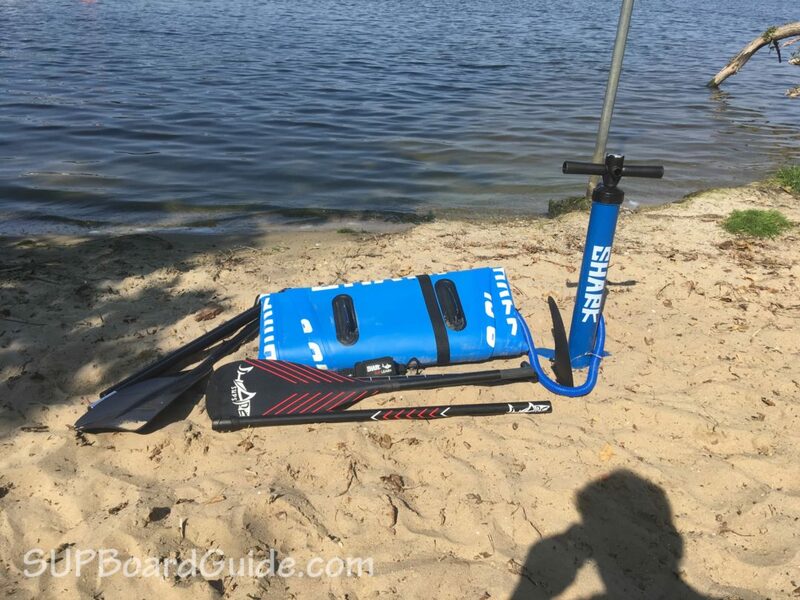 Update: Shark now includes the light blue backpack in the standard package with your board. That’s a fantastic upgrade! You get a really well-made backpack that you can travel with or take on a long hike. 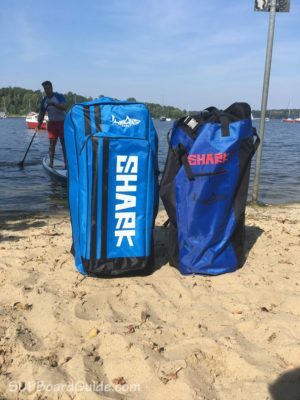 The standard bag that comes with the board fits your SUP and accessories easily, and the materials won’t rip or tear on your first few uses, however, for long hikes, it’s not amazing. Which is why there’s an optional upgrade purchase for your backpack! The upgraded backpack is a delight to carry and zip your gear into. The improvements are in the support and that little bit of extra room for all your gear. You can easily fit your board, paddle, pump and still have extra space. The padding is exceptional, the zippers strong and you have plenty of straps and extra storage. You can notice the improvements of the upgrade to the standard when you put the two bags side by side. If you are as fresh as a daisy to the SUP world, you may find the Lemon Shark Cross trickier to handle than say something like the iRocker All Around. But if you like a challenge, you’ll quickly grow into the Lemon Shark and be rewarded for your hard efforts within a few weeks of consistent paddling. 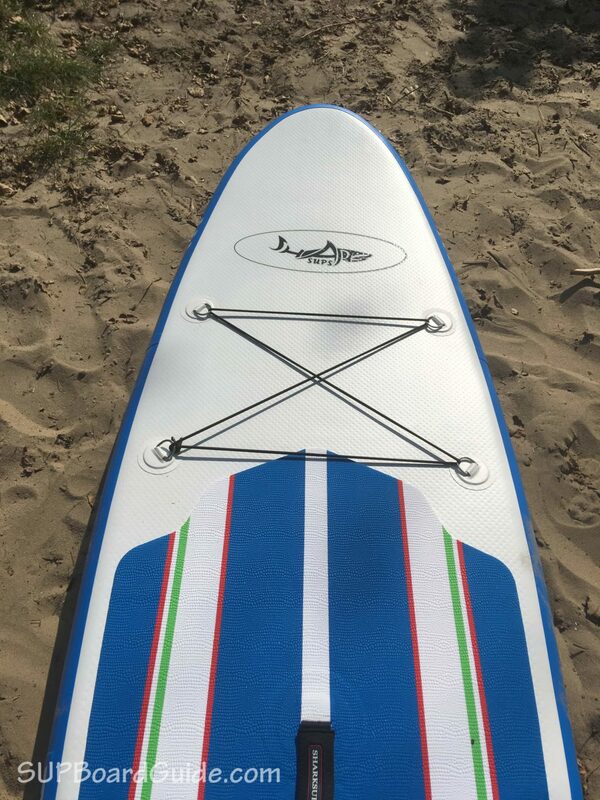 It handles waves better than most other allrounders due to its pointed tail. 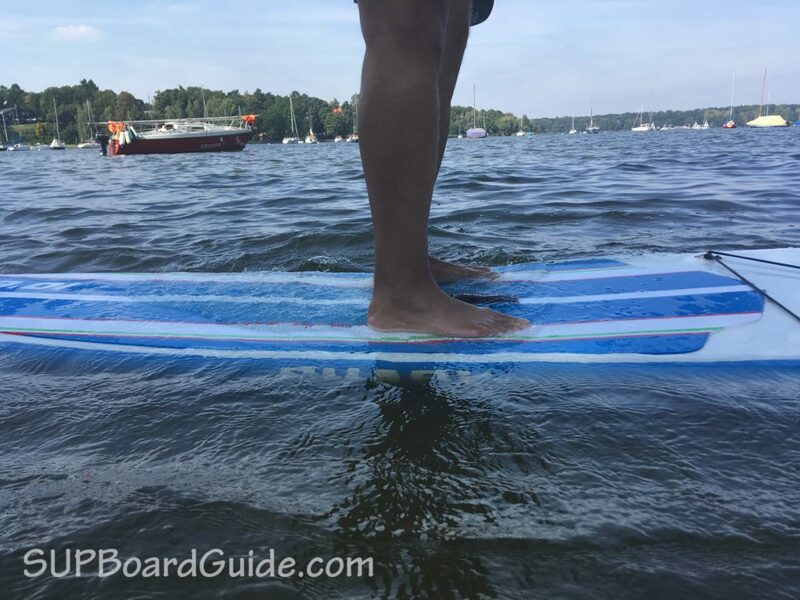 So intermediates that enjoy a light surf but still spend time cruising, you should highly consider this board! Heavier riders (Above 80kgs) beware of the Lemon Shark, you may find yourself going downwards more than forwards. Check out the 6″ thick version instead. However, If you fall below the 75-80 kg mark, the Lemon Shark will float you like a cloud in the wind. For heavier riders, the 11′ long and 6″ thick version is definitely the better option. Just out of curiosity: I have seen a lot of reviews already but I have not seen any reviews about jobe sups. Do you have any experience with these boards? I like your reviews a lot though!